Stake your online presence...beautifully! Your eEdge website is the quickest, easiest, and most cost-effective way of making your place online. This service includes an eEdge Website Branded Banner—a beautiful, high-resolution image of you to greet visitors to your site. 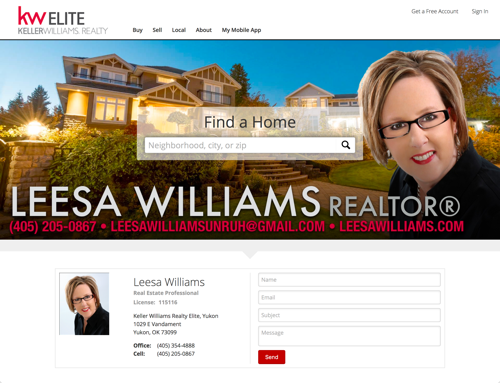 Your eEdge website will be fully-functional with full OKCMAR MLS search, lead capture, extras like an auto-updating This Month in Real Estate video from KWRI, a school search widget, and a download page for your branded KW Mobile App. You've set up your eEdge website, but you just need to give it that eye-popping touch when clients first set foot on your site. The eEdge Website Branded Banner service gives you a beautiful, high-resolution banner image on the "Home" page of your eEdge website. The banner features your headshot and contact information on a background showcasing your Oklahoma City or Yukon area of expertise. The image also draws attention to the large "Find a Home" search box that your visitors came to your site for. Make every email a face-to-face conversation with professionalism, functionality, and beautiful design. This isn't just a static, useless image in your signature. Along with your photo, you'll send clickable, tapable, interactive information. Let your clients tap to call you, email you, visit your website, or your social media outlets—all done with beautiful, functional HTML in your email signature.